New Tirion TriRetrograde equipped Swiss automatic movement Milus 3838 (base caliber ETA 2892-A2) at 21 stone. Equipped with caliber frequency 28,800 vibrations per hour, 40-hour power reserve, and display functions, hours, minutes and seconds (through three successive working for twenty seconds retrograde arrows, which are located at the labels 6, 9 and 3). 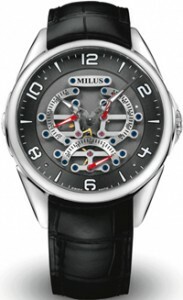 The model comes on a black leather strap with stainless steel buckle. You can buy watches from $ 5,000 to $ 10,000.